Families, educators, and community members are encouraged to join the conversation with Superintendent Reykdal at a series of forums in four Washington communities. 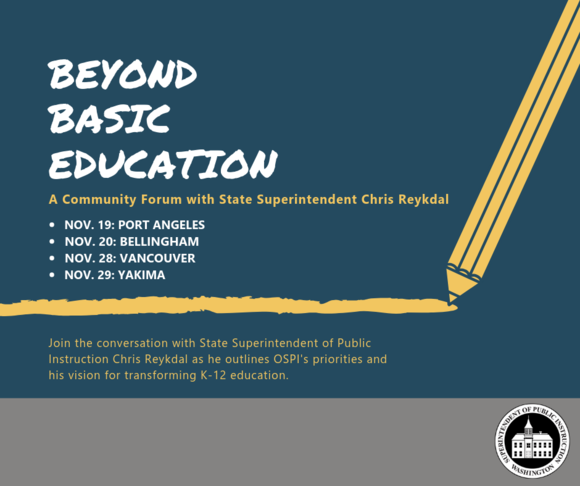 OLYMPIA—November 13, 2018—Over the next few weeks, Superintendent of Public Instruction Chris Reykdal will be holding four community forums in Washington. 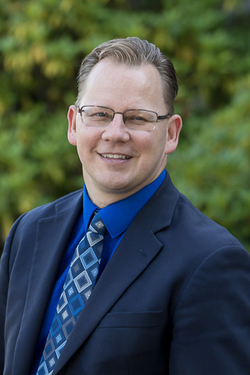 At the forums, Reykdal will outline his vision for transforming K–12 education and the Office of Superintendent of Public Instruction’s (OSPI) budget priorities for the upcoming legislative session. There will also be time for a moderated question and answer period with the audience. “We’re calling these forums ‘Beyond Basic Education’ because we are at a critical point in time where the Legislature has invested new funding, our teachers are finally getting to market rate compensation, and we have the ability to really begin thinking beyond the basics,” Reykdal said about the forums. “I will share some of the ideas I have for going beyond ‘basic’ and transforming education, but I also want to hear from parents, families, educators, students, and community members,” he continued. Each forum will begin with opening remarks by the local school district superintendent. Following their remarks, Reykdal will speak about OSPI’s 2019–21 budget proposal, which aims to close opportunity gaps by increasing spending on comprehensive supports, pathways to graduation, and creating a new model for funding elementary school buildings, among other things. The forum will close with a question and answer session with Reykdal, moderated by a local reporter or community member. Each forum will be about 90 minutes long. Translation services will be available for those who need them. Please contact commteam@k12.wa.us to make arrangements in advance.